The Bickerston Prior Cosmetic Clinics offer the latest techniques in ophthalmic and cosmetic surgery for the eyelids and mid-face. This is to improve the function and cosmetic appearance of the eyelids and rejuvenate the face. We have a great deal of experience in this area and have pioneered new techniques. We commonly deal with referrals for complications of the eyelid and mid-face operations. Consultations and non-surgical facial rejuvenation is performed in well-equipped Bickerston Prior Clinics. Advanced aesthetic surgical procedures are performed in a dedicated cosmetic theathre in Spire Hospital in Norwich. Spire Hospital Norwich is situated just off the A47 southern by-pass, close to the University of East Anglia and just three miles from the city centre. Norwich is 116 miles from London and London Stansted Airport is approximately 75 minutes by car. By car - Spire Hospital Norwich is on the western edge of Norwich, close to the University of East Anglia and just three miles from the city centre. 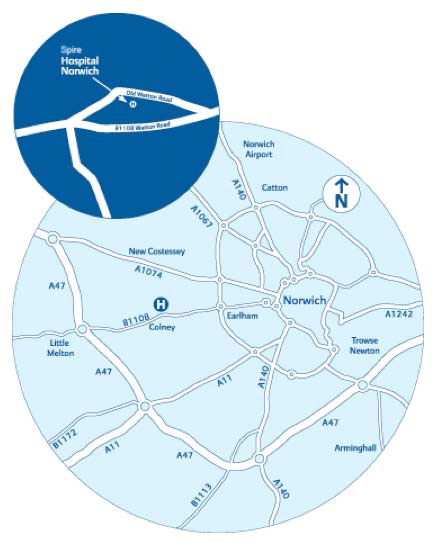 It can be reach either by the Earlham Road (B1108 following signposts to the University of East Anglia) or the A47 southern bypass (exit junction B1108 and follow signs to Norwich).